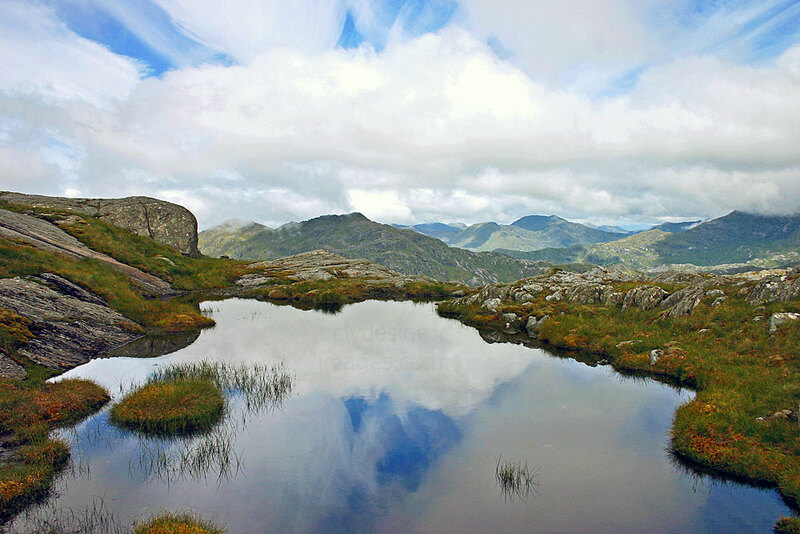 ​This section includes not only Knoydart, but Glen Pean, Glen Dessary, Glen Garry and the Loch Lochy hills. 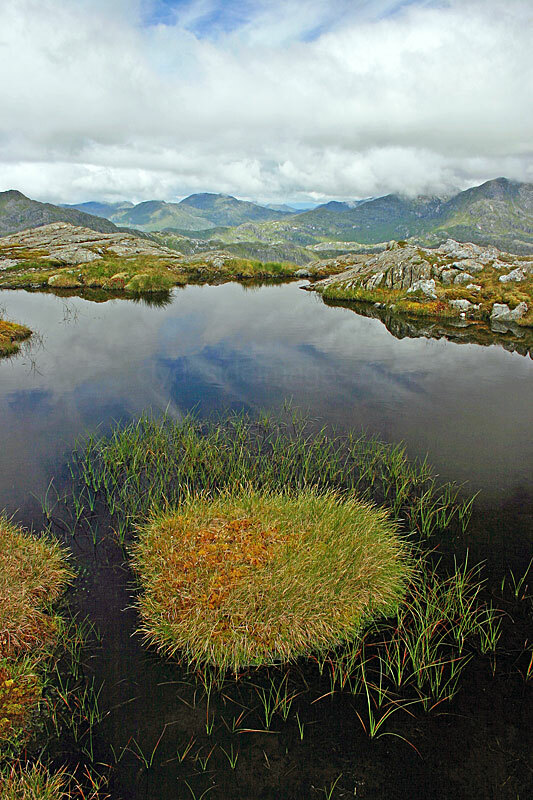 The rugged nature of the terrain in Glen Dessary is identical to that of the Rough Bounds of Knoydart which lies to the north. The summit of Carn Mor is the high point at the end of an 11km ridge which divides glens Pean and Dessary. 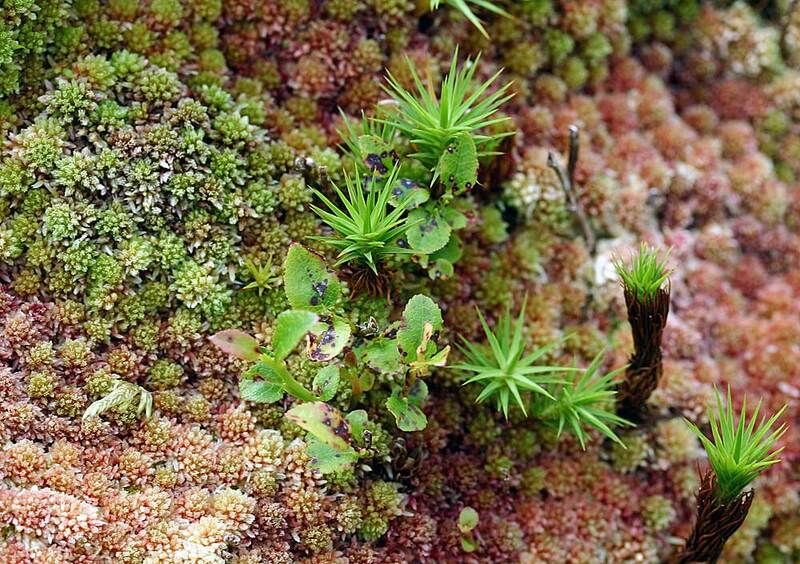 The most popular approach, which I took, is from Strathan, reached after a long drive along Loch Arkaig`s northern shore. Forestry covers much of the area and a bulldozed track from the road end leads through the dense conifer plantation on the south side of the River Dessary to A`Chuil Bothy. These `bothies` are usually derelict farmhouses or shepherd`s cottages which, following renovation, have traditionally provided free but spartan shelter for hill-goers. The Mountain Bothies Association maintain the majority of these shelters with members volunteering to carry out any necessary repairs. Just beyond A`Chuil, there are a couple of treeless breaks in the plantation, left with the intention of limiting the spread of flames in the event of a forest fire. I struggled up one of these fire-breaks, heavy going on the uneven and badly overgrown ground, onto the open hillside. 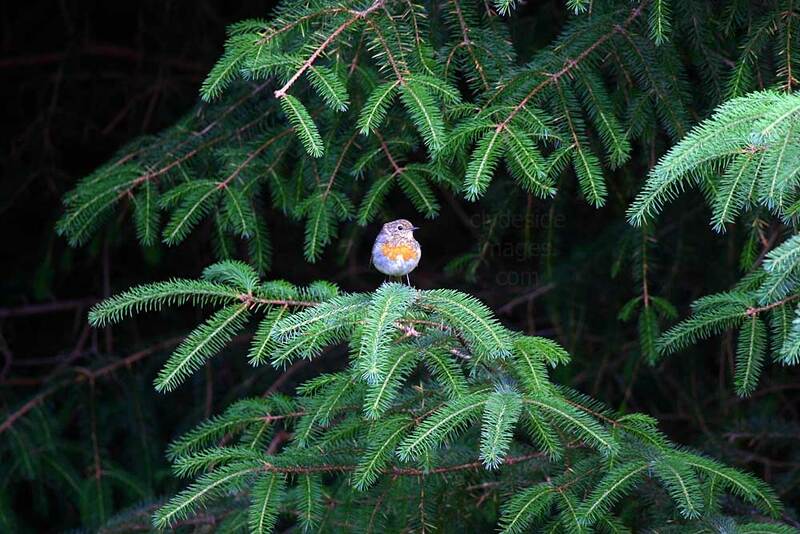 I had the hill to myself and there was plenty to see as I gradually worked my way along the ridge to the top, passing small lochans, spotting a herd of deer and a variety of small birds. 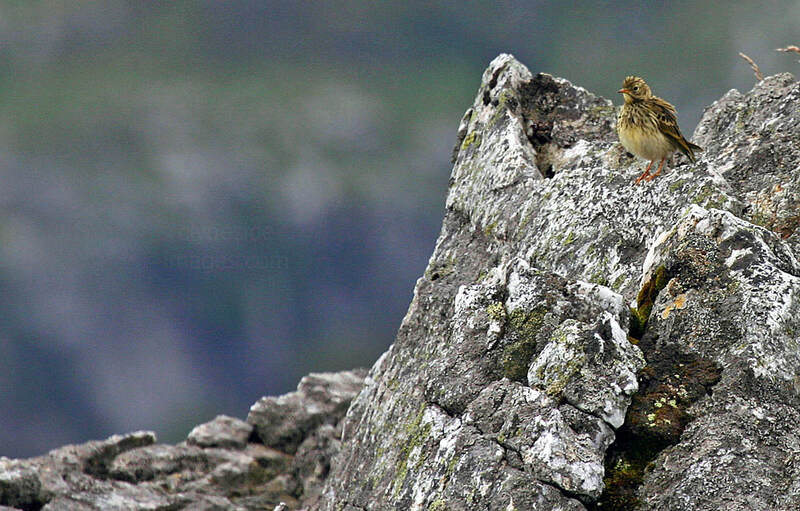 A colony of Meadow Pipits were in residence, nesting amongst the rocks surrounding the cairn. Another path leaves Strathan for the head of Loch Nevis, and takes a more direct route via Glen Pean. 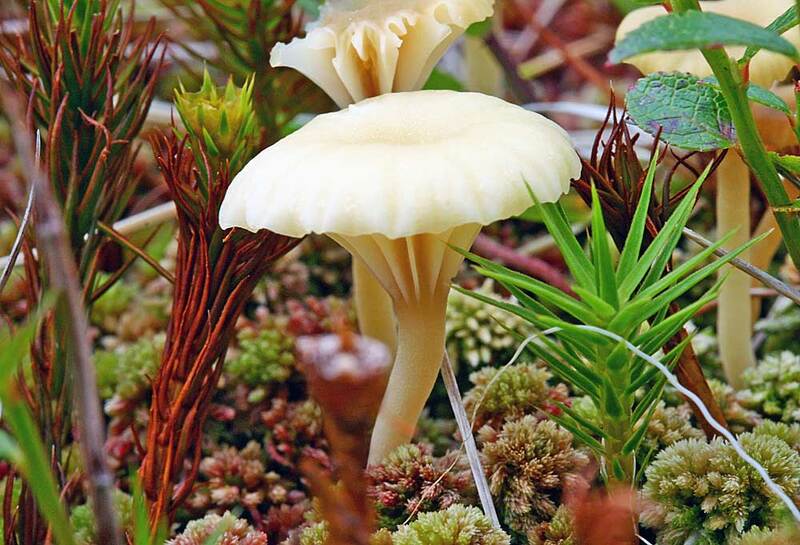 It is at a lower elevation than the Dessary track but can be very wet underfoot. 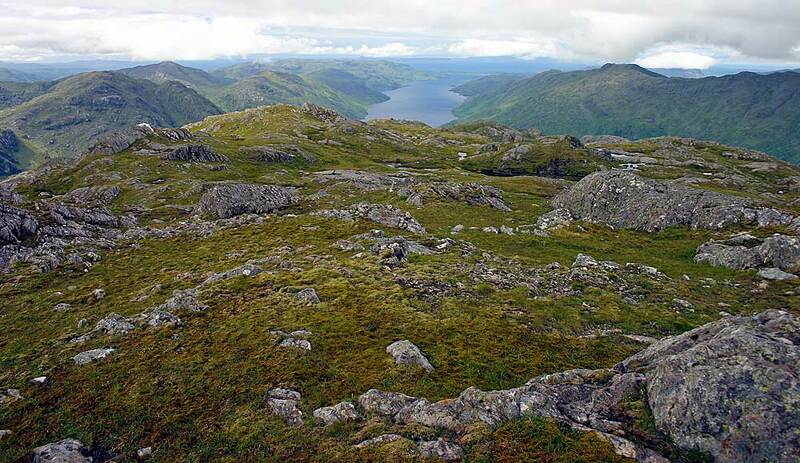 ​Either way, all the approaches into Knoydart and the surrounding area are long and require a fair bit of effort. ​As an alternative, some walkers opt for a leisurely boat trip from Mallaig. 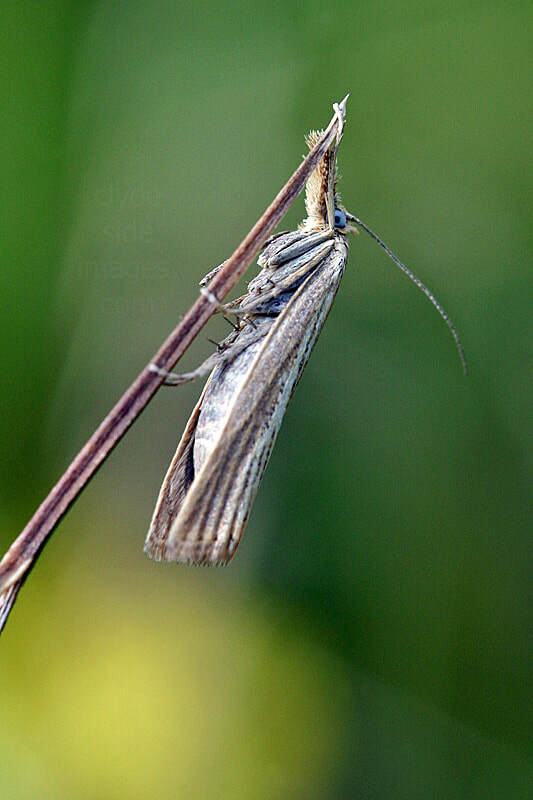 There are apparently several obliging skippers that will ferry walkers to Inverie, on the northern shores of Loch Nevis, or the head of the loch where another remote bothy, Sourlies, can be utilised. 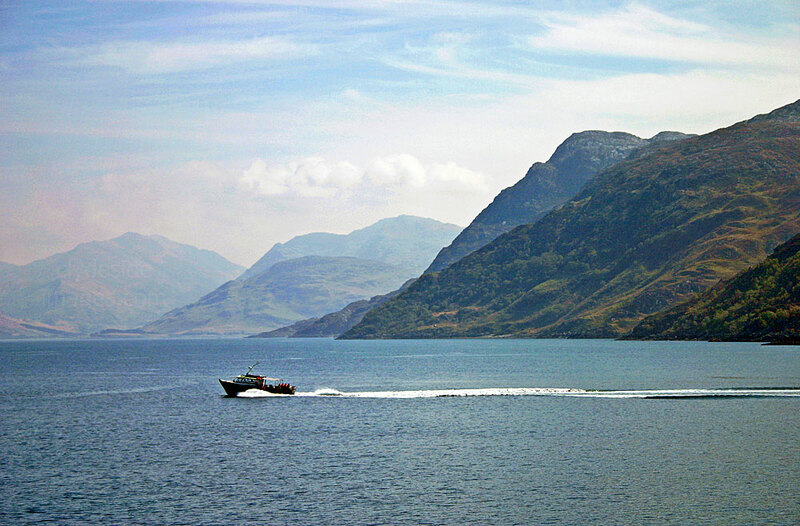 ​This photo shows a boat passing the mouth of Loch Nevis and a seaborne approach to these peaks on such a fine day would certainly be a highlight of many people`s trip. These Red Deer were feeding high up on the mountain`s southern flanks. 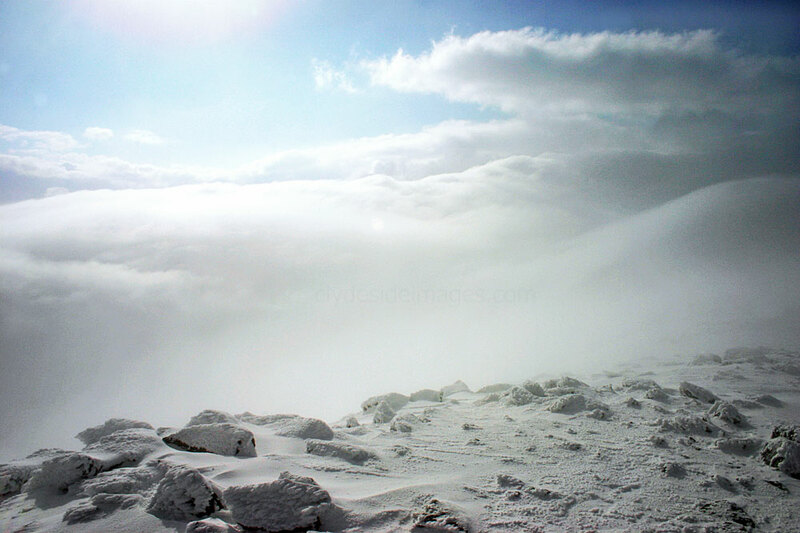 ​Views from the summit of Carn Mor: The peaks above lie to the southwest. Loch Morar from the top. The low-lying Isle of Eigg, partially screened, is visible in the distance with its distinctive rocky `Sgurr` on the left. 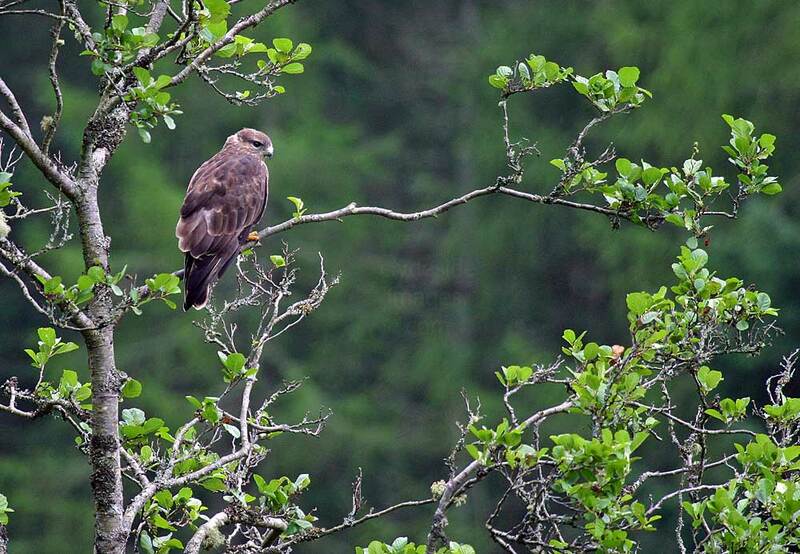 Human intrusion is still fairly rare in these parts and as a result it`s a great area for wildlife. 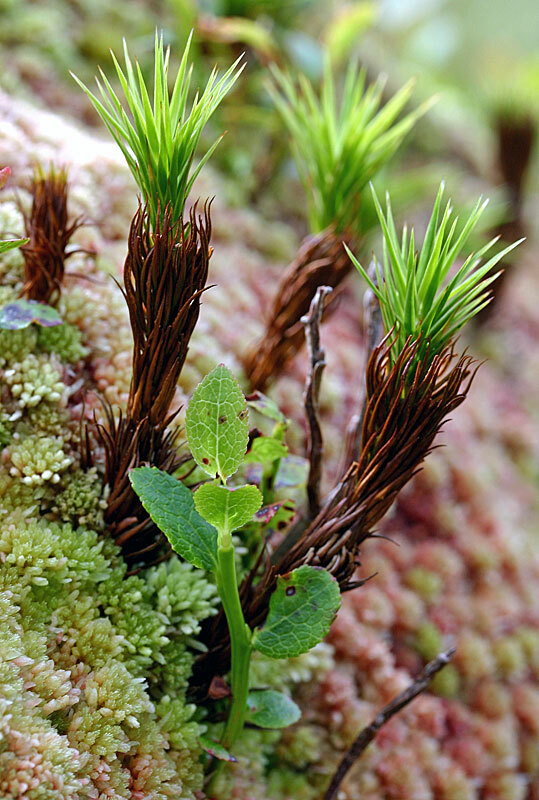 Plant life is also abundant and mini lichen and fungi forests grow on some of the boulders dotted along the mountain`s crest. 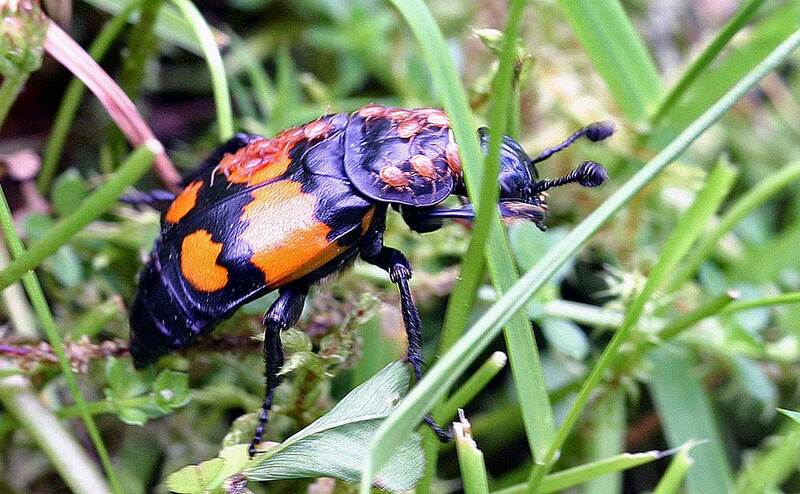 Fortunately my Macro lens was still on the camera when I noticed this Sexton Beetle scurrying past. 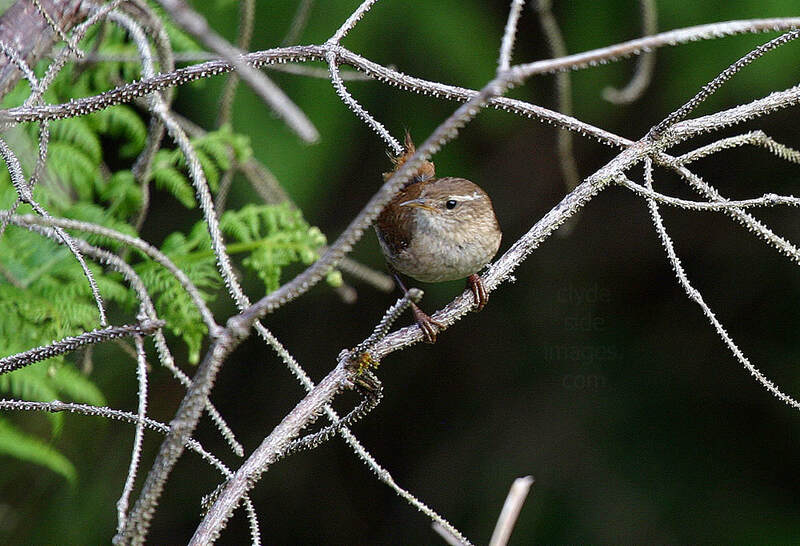 Although I`d never seen one before they are supposedly widespread throughout the UK. 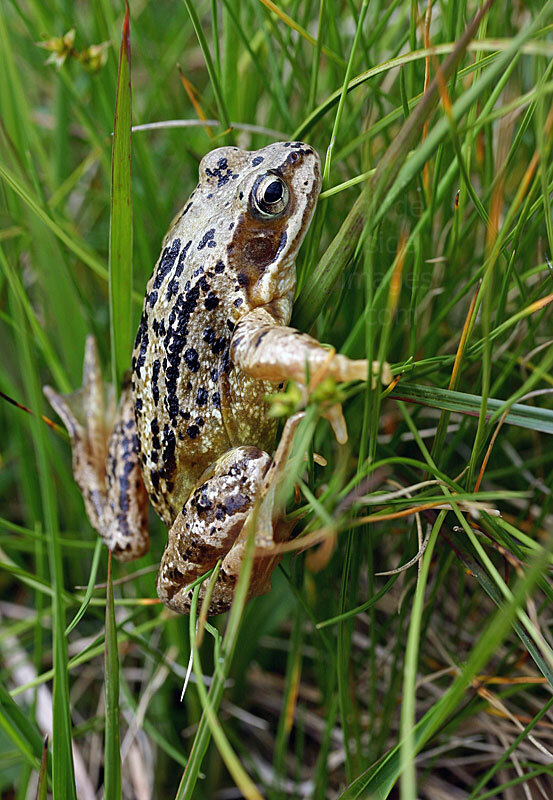 These creatures bury carcasses of any small birds or animals they find and lay their eggs on the remains which act as food for their larvae. ​I just managed to photograph the beetle before it disappeared into undergrowth and didn`t realise that it was carrying its offspring on its back! 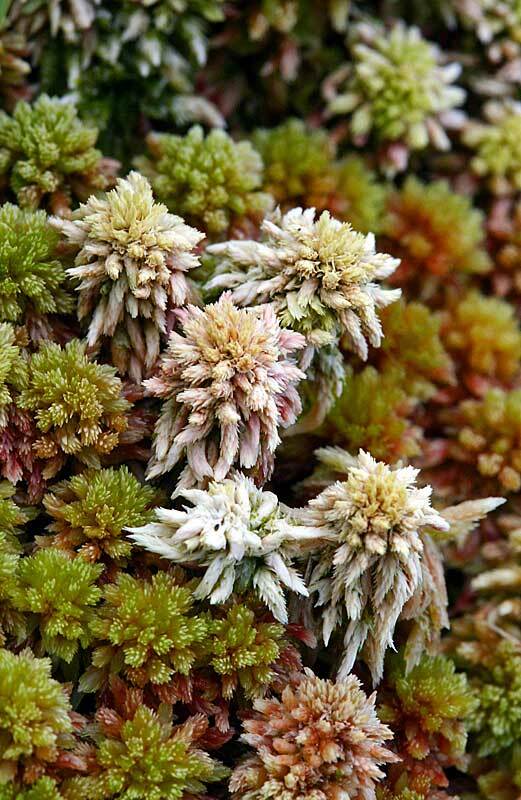 It was only when I got back home and saw this image fully enlarged on my computer that I noticed the tiny hitch-hikers. 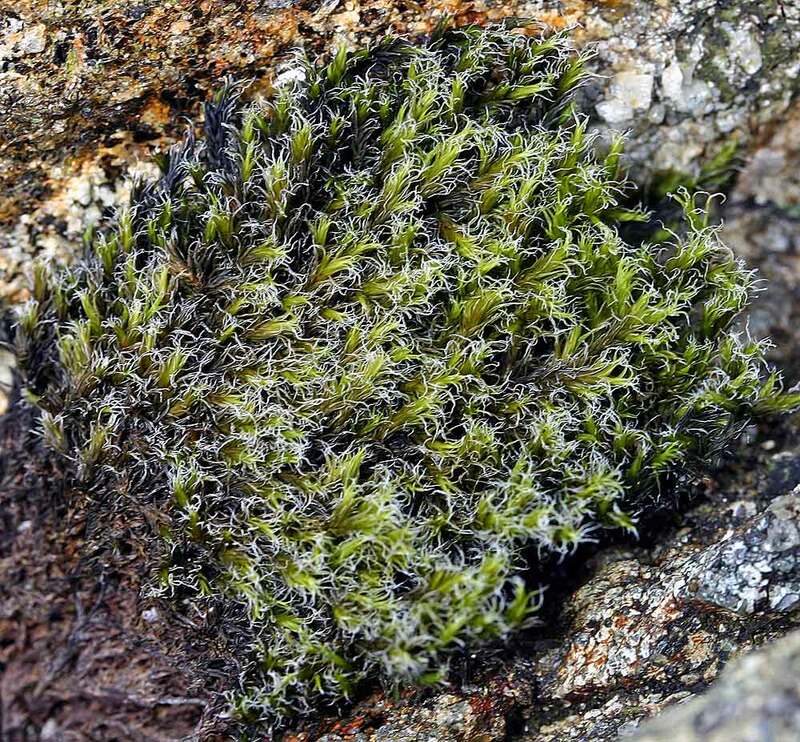 Below: These plants were growing on a boulder near the summit. 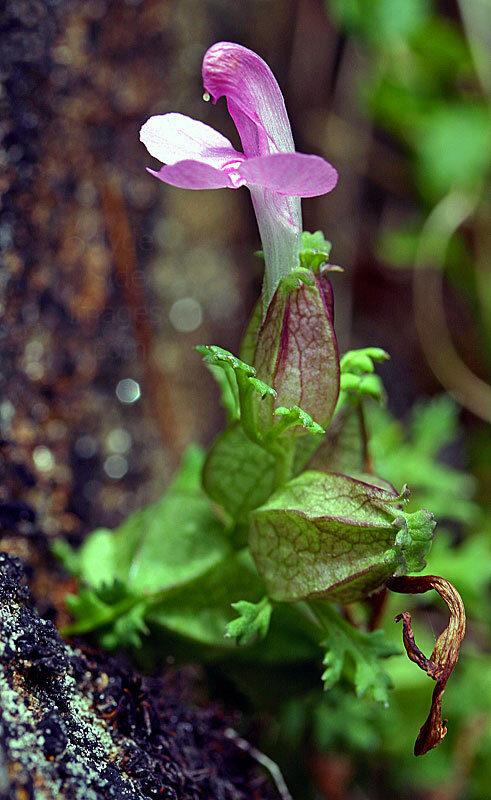 The Lousewort (below right) is a semi-parasite, taking water and nutrients from the roots of other plants. 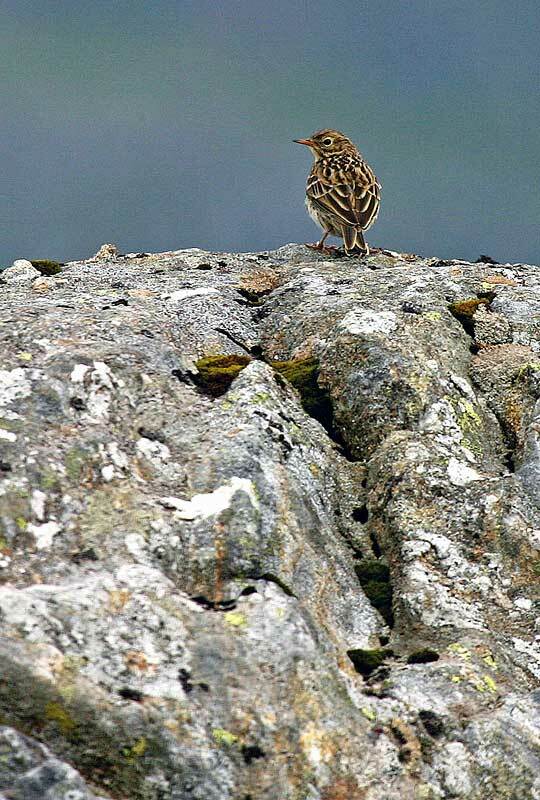 Meadow Pipits were hopping around while I was eating my sandwiches but didn`t move in to eat the crumbs I`d left until I`d set-off down the hill. 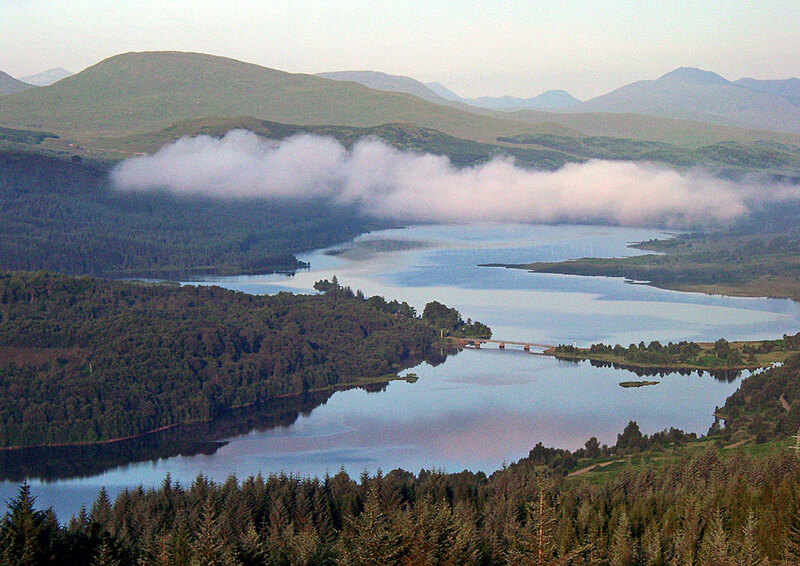 Ben Tee, just short of Munro height, is a conspicuous conical hill situated between Loch Garry and Loch Lochy. I followed the most popular approach from Kilfinnan at the north end of Loch Lochy and, despite a bright start, the clouds increased and wild weather blew in to block out any view from the summit ridge. I sat freezing at the cairn for almost an hour hoping for an improvement and the clouds parted briefly to show blue sky above, but the surrounding hills remained totally obscured. A visit to Skye saw a pal and I leaving the house at 2 a.m. in order to take in these two Munros en-route. Parked on the north side of Loch Quoich beside the Tomdoun to Kinlochhourn road where an airy stalker`s path zigzags up the south-west ridge of Gleouraich, almost to the summit. This made for a quick ascent and after stopping for a while at the cairn we continued along the ridge to the subsidiary top of Craig Coire na Fiar Bhealaich, where my pal called it a day. 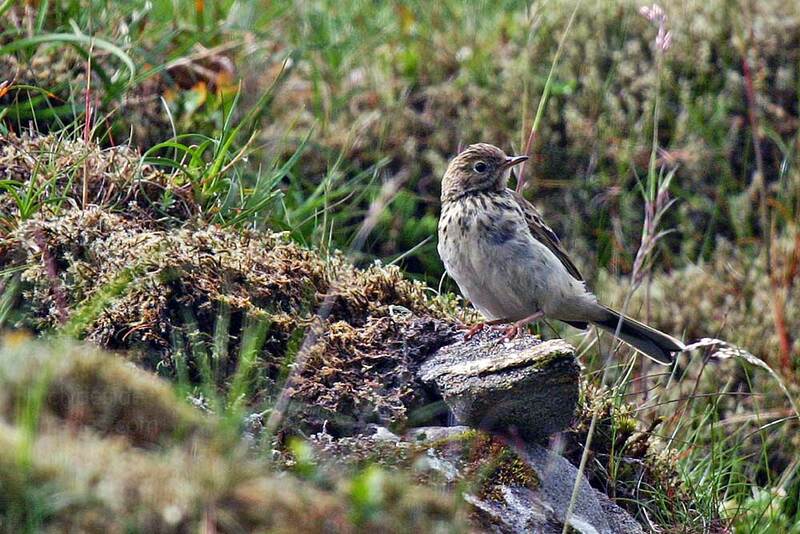 I took in the other Munro, Spidean Mialach, and was rewarded with good views eastwards towards Loch Loyne. There were even a few patches of blue sky. As we drove north towards Kyle of Lochalsh the rain came on with a vengeance. After an overnight stay at a Youth Hostel on Skye things were just as bad the following morning with no hope of improvement so we drove to Armadale for the Mallaig ferry. Cabaret was provided at the ticket office by a large Italian woman yelling at her husband whom she was obviously blaming for some problem with their tickets. Sgurr a` Mhaoraich stands in a commanding position above the head of Loch Quoich, just south of the South Cluanie Ridge, and consequently its summit makes an excellent viewpoint. Although poor, the weather was due to clear first thing so I left the house in the early hours and parked the car beside Loch Quoich about 6 a.m. snatching a few hours sleep. The sun was taking a long time to appear but I set off up the Bac Nan Canaichean ridge at 9 a.m. to be soon enveloped in cloud. I was soaked by the time I`d crossed the rocky section near the top and made the summit. With no view whatsoever I didn`t hang around and continued on a compass bearing for about half-a-mile to Sgurr a` Mhaoraich Beag, the mountain`s western top. I`d originally intended to return over Am Bathaich which overlooks an impressive corrie on the north-east side but with no prospect of a view I dropped south-west to the Kinlochhourn road. A woman, obviously local, had pulled over at the roadside and was throwing bales of hay onto the road from her Land Rover. She had attracted a large herd of red deer, obviously desperate for food as they weren`t as wary as usual and it was a good opportunity to observe them at close quarters. This was the highlight of a disappointing trip and even that came to an abrupt end when four tourists in a car with Dutch number plates appeared, stopped when they saw the deer, then rushed out to take photos. The deer scattered immediately and the would be photographers got back in and drove off, leaving the wee woman (and I) very unimpressed! I left the house just after 7 a.m. and reached Loch Quoich three hours later for another shot at this Munro en route to Suardalan Bothy. Although the tops were totally clear of snow, there were quite a few stags down at the roadside. I parked beside the stalker`s path to find one other car already there. There was a considerable amount of low cloud about but it either drifted clear or stayed just above the loch to give the impression of a temperature inversion. There were excellent views this time after seeing nothing on my first ascent and about half way up, I saw the occupants from the other car in the distance - a couple from Inverness and their Spaniel. They just reached the top before me and we sat at the cairn chatting for about fifteen minutes, before I headed for the subsidiary top. The R.A.F. were training and I glimpsed two low-flying jets through gaps in the cloud. Lower down, I disturbed a flock of five Ptarmigan looking a bit out of place in their mainly white winter plumage. I drove round towards Glen Shiel but was held up by temporary traffic lights on the A82, in place to allow a helicopter, bucket strung underneath, to lift cement from the roadside, up to a construction site on the hill. I pulled in to the Cluanie Inn car park park to find three pals at the bar and joined them for a pint. Part of the `bothy gang` they`d been at Suardalan already and dumped most of their gear along with the first bags of coal etc. 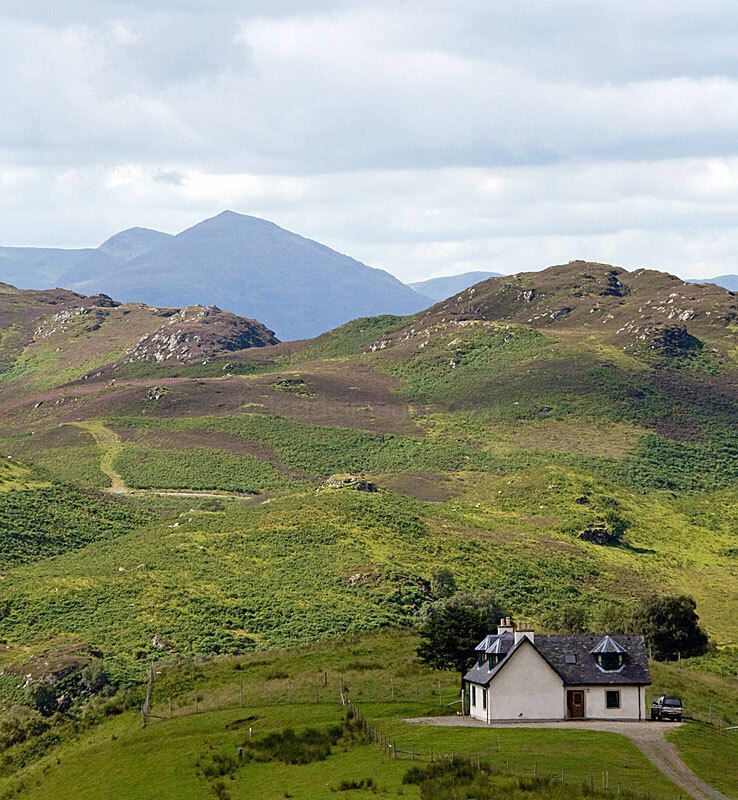 From the end of the track it`s only a ten minute walk to Suardalan bothy - a real bonus! After climbing Beinn Sgritheall in the morning, I drove round to the dam at the east end of Loch Quoich to do this isolated Munro. Initially the path skirting the loch shore is badly eroded but it improves as it climbs, westward towards the summit. It peters out on the wide ridge and surprisingly there`s a narrow, rocky section before the final steep rise to the top. The summit area is quite spacious and grassy and I remember thinking that it would make a good camping spot. 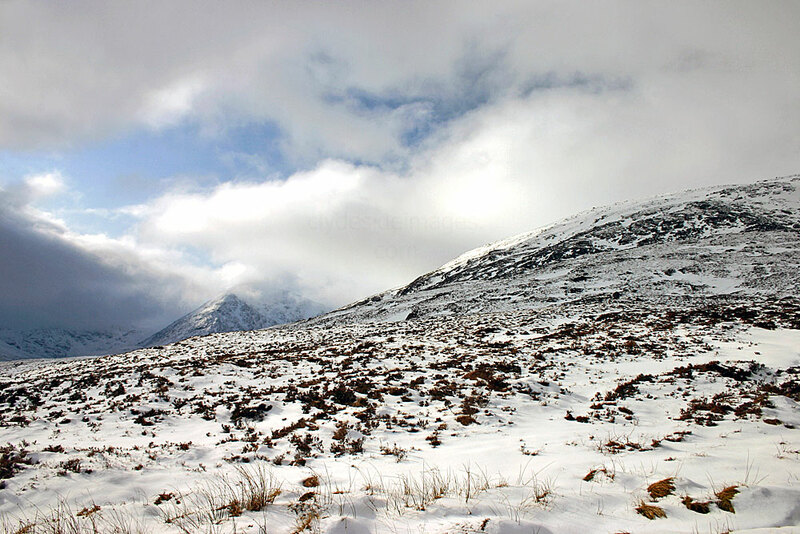 Gairich can also be climbed from Kinbreak Bothy to the south but the overall distance to the peak from the nearest road makes for a far longer expedition. 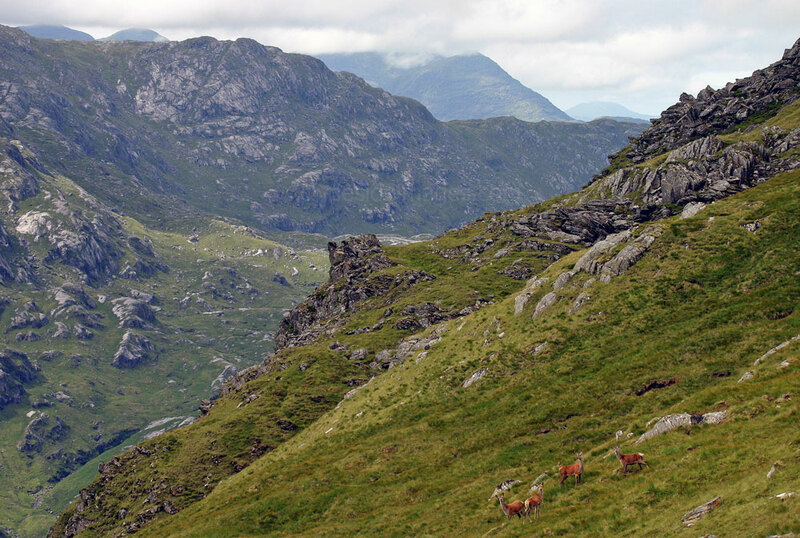 The Knoydart peninsula is one of the wildest and most inaccessible parts of the Scottish Highlands. No roads penetrate into this area, and access is either by boat or on foot along one of the rights-of-way which continue westwards from the nearest road ends. 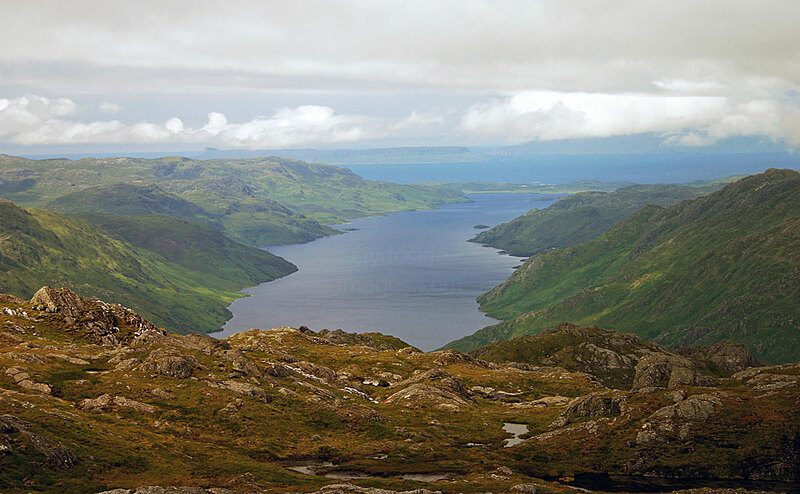 Knoydart is bounded north and south by Loch Hourn and Loch Nevis, each thirteen miles long - the lochs of Hell and Heaven. The names are apt. Both are sea lochs but there the similarities end. 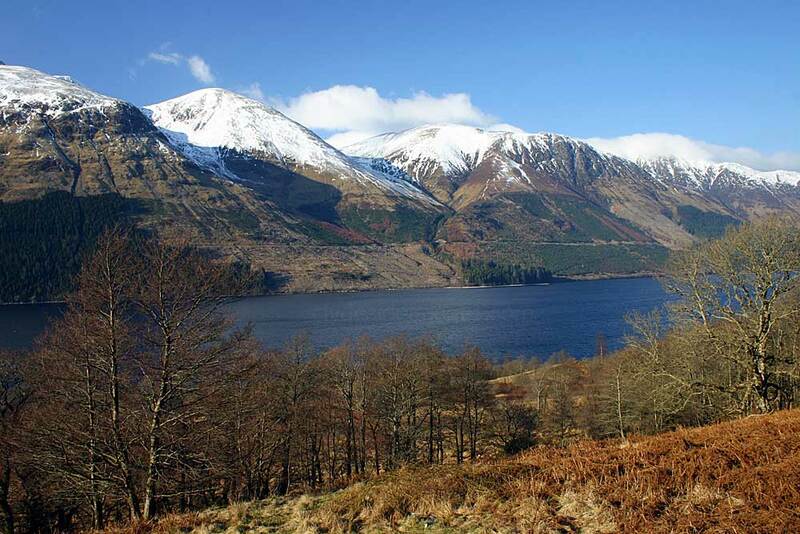 Loch Hourn is flanked by steep mountains, rising to 3,000 feet on both sides, and the inner loch is much narrower than Nevis to the south. No sun shines on the inner loch shore during the winter months, whereas Loch Nevis is more open and sunny. No big mountains lend drama to it`s outer reaches, but the head of Loch Nevis is ringed by mountains, especially impressive when seen from the west. 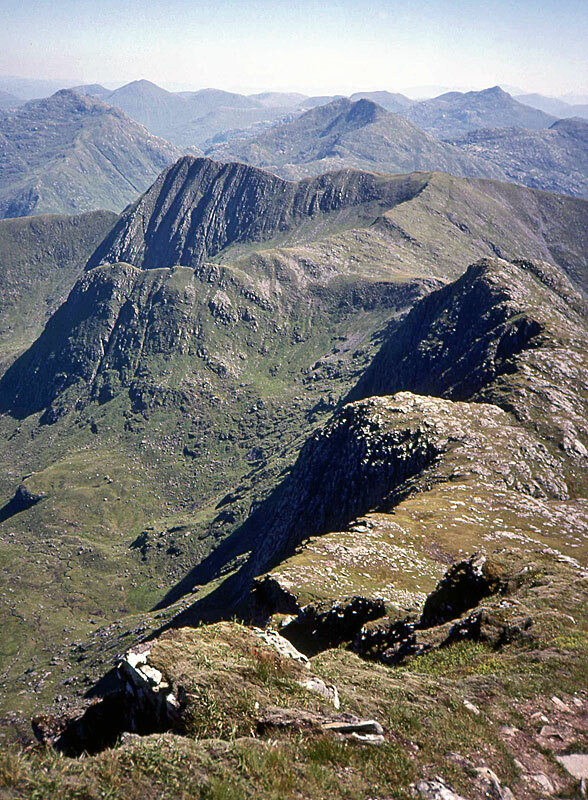 Sgor na Ciche, although just outside the peninsula proper, rises in a series of terraces, to a cone of perfect symmetry and typifies the Knoydart peaks. 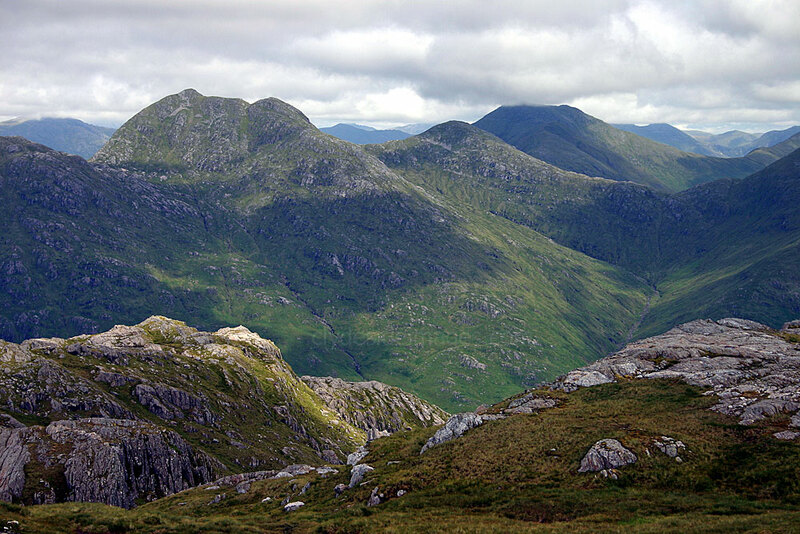 Because of the remoteness of Knoydart, the climbing of its mountains entails finding overnight accomodation in the area. Apart from bed and breakfast possibilities at Inverie, there are bothies at Sourlies and Barrisdale and a camp site at the latter. 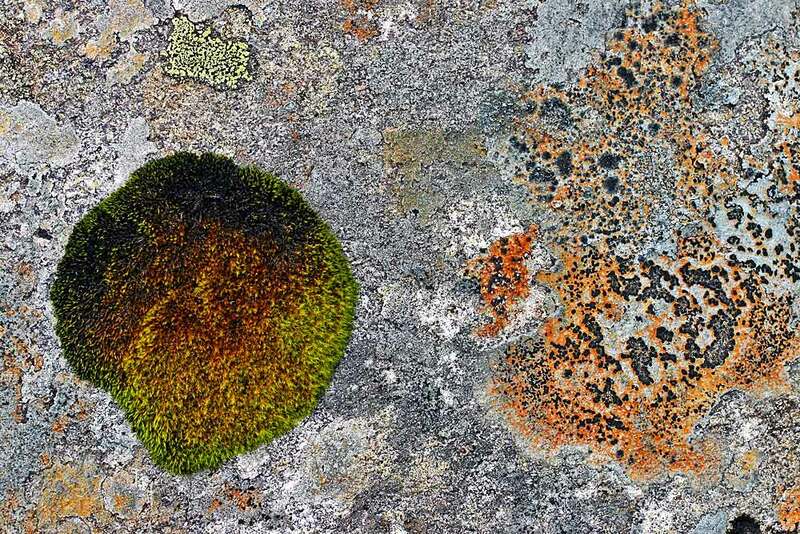 Wild camping, although discouraged, is possible almost anywhere. 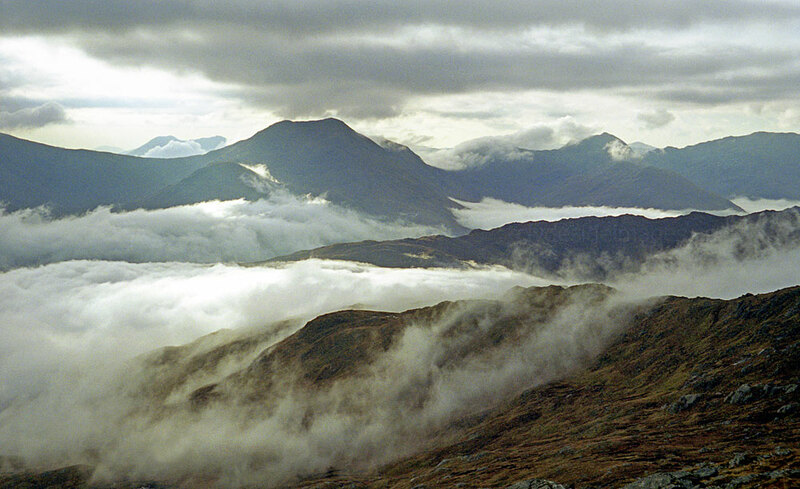 Knoydart holds the record for the heaviest rainfall in the Highlands and most of the approaches are rendered impassible when the burns are in spate. I`d camped by the roadside on the north side of Loch Quoich on the Monday evening after climbing Beinn Sgritheall and Gairch and woke early. It was very warm, even at 5.30 a.m., so after a quick cup of tea I dismantled the tent and made the short drive to Kinlochhourn. This was my first outing on the track to Barrisdale and had it to myself all the way. The views unfolded as I headed west and half way there I stood watching a fisherman in his motor boat heading out into the loch. I was so busy watching the boat that I didn`t notice a seal basking on the shore a few feet in front of me! It plopped into the water before I could dig my camera out of my rucksack. Once past Barrisdale Lodge and its bothy I continued across the flats to the east end of the mountain and followed the ridge round Coire Dhorcrcail to the main top. Just before I reached it I found a scraggy sheep and lamb, badly needing clipped! For me, the highlight of the day was the tremendous Stob a` Choire Odhair ridge on the descent. It was very rugged and would make a terrific winter expedition. The temperature was well into the 80s, so with supplies of water, beer and Ribenas exhausted I stopped at Barrisdale bothy and filled my water bottle to capacity. I spoke to a guy who`d did a couple of hills the day before but, due to the heat was spending the day indoors. I soaked my T-shirt under the tap, placed it over my head and set off for Kinlochhourn. ​Just past the lodge, the farmer was about to drive off in his tractor. It had a trailer attached with a Collie inside. I let him know about the stray sheep on the hill and he offered me a lift to the to start of track at the end of the bay which saved me about a mile. I jumped in beside the Collie and we both bounced about as the tractor drove flat out. It felt a lot faster than it actually was but the dog was in his element. All he needed was a crash helmet! By the time I`d walked back to the car I was badly dehydrated and ready for some well earned sleep. The above shot, scanned from a 35mm slide, was one of just a few shots taken during the climb. Looking towards Knoydart from the Isle of Skye`s Sleat peninsula. 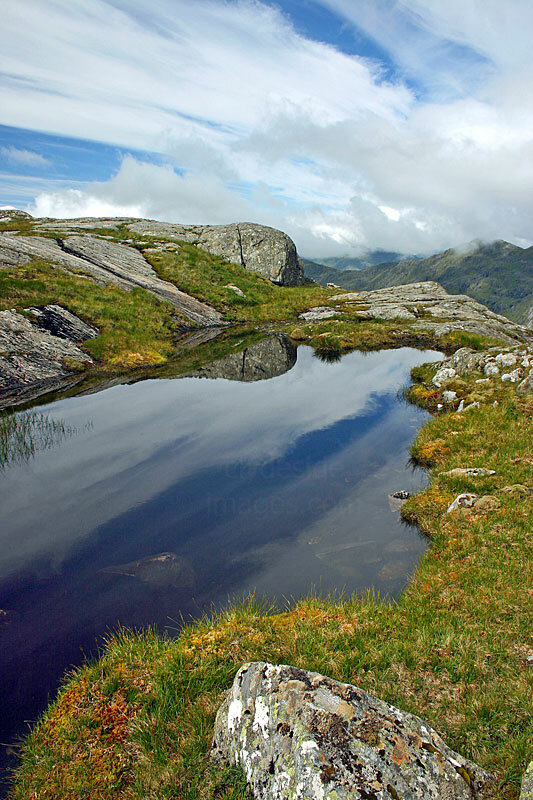 Meall Buidhe and `Loony Bin` were the only Munros I`d still to do on the Knoydart peninsula and I discovered later that it was exactly six years to the day that I`d walked in to Barrisdale from Kinlochhourn and climbed Ladhar Bheinn! I didn`t leave home until early afternoon and consequently it was slow going on the A82 with tour busses and caravans winding their way north. The forecast for this trip was reasonable but it was cloudy by the time I`d reached the road end at Kinlochhourn. I was annoyed to see a sign stating that there was a compulsory parking fee of £1 per night and I called at the farm to see what the score was. The farmer said that the fee had been introduced recently, to help towards the maintenance of the paths etc, and walkers were required to leave details of which hills they intent to do, so that if they became drastically overdue, it would be easier to carry out a search! It began to drizzle soon after I set off on the six-mile walk to Barrisdale and, by the time I`d arrived, I was ready for my supper of beans, pork pie and tomatoes which I scoffed after hurriedly pitching the tent. There were around fifteen other tents and the adjacent bothy was busy too. I popped in to put another quid in the Honesty Box to cover the camping fee, then got into my sleeping bag and crashed out right away. After a really sound sleep I got up at 7 a.m. It was still dull as I headed up Glen Unndalain but it stayed dry despite the clouds periodically skimming the tops. As the view opened up I saw a fleet of Klondykers` fishing boats from eastern Europe, anchored in Loch Nevis. At the summit of Luinne Bheinn I sheltered from the cold wind and boiled up some water on the stove for tea. My KSB boots were now well past their best and my feet were very wet and sore by the time I reached the top of Meall Bhuide.